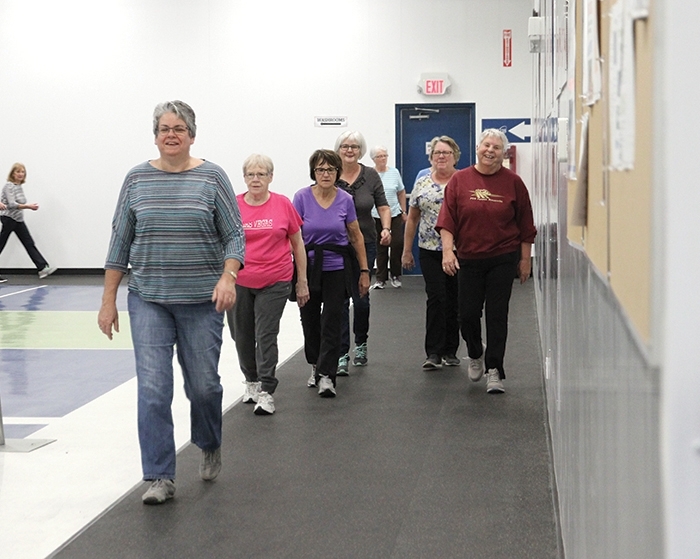 The walking track at Moosomin’s PotashCorp Sportsplex is well used, with many walkers doing laps on the track every day. Catherine Jaenen of the town’s recreation department has come up with challenges to keep walkers motivated—their laps are recorded and their progress along the Trans-Canada Highway is tracked. The walking track at the PotashCorp Sportsplex has turned out to be more popular than anyone expected. The original plan was for the Sportsplex to operate over the winter and close entirely in summer. The group of dedicated walkers didn’t want to give up walking over the summer, so volunteers were found to keep the building open two hours a day over the summer for walkers. Now that the facility is open again, more and more people are walking all the time. “When Mike (Schwean) was planning the Sportsplex, he just thought this was wasted space, so why not add rubber to it and make it a walking track,” says town recreation employee Catherine Jaenen. “The Shriners donated to build the track. Then it was Mike’s idea to do the Number One Walking Challenge, where we count their laps and measure their distance walking across Saskatchewan. “We thought that would take people forever. “Nope. Lots of people are already done. “The challenge was to walk the distance across Saskatchewan on Highway 1, which is 650 kilometres, which is 6,500 laps. “Some of them finished that and the walkers were waiting for the new challenge to start November 1. “Now we have a lot on the new challenge—it’s from the Alberta border to English Bay in Vancouver. “It’s 1,345 kilometres. The walkers keep track of their laps and every few feet we have stops along the highway on the wall. We have some facts about each town. We put the names of the walkers with the town they’ve made it to. The walking track has proved so popular that the walkers convinced the town to keep the Sportsplex open in the summer for walking—the original plan was to close the Sportsplex entirely in the summer. Instead, volunteers opened the Sportsplex each day for two hours so people could keep walking. The walking track is open Mondays and Tuesdays 9:30 to 11:30 am, Wednesdays 10 am to noon and 4-10 pm, Thursdays 9:30 to 11:30 am and 4-10 pm, Fridays, Saturdays and Sundays 10 am to 10 pm. She said the walkers appreciate the facility, and many believe there are health benefits to regular walking. “We have one person who has lost over 60 pounds since she started walking nine months ago,” says Catherine. “She started walking nine laps and now she’s at about 130 a day. She said there is a wide range of ages and abilities among the walkers. “We have people from their 30s to their mid-80s. She said the walking track is more popular than anyone expected. What does she enjoy about walking? “I enjoy meeting people I’ve never met before, walking along, chatting getting to know them. The challenge Catherine figured out is unbelievable. It’s definitely an incentive to keep walking and see where you are. She needs to be commended for it. She said there has been a big increase in the number of walkers this fall. “I didn’t really walk. I’m a fair weather walker to start with, and our streets are made for water runoff, not for people to walk along the side of the street. She said walkers are appreciative of the track. She said there are many benefits to the walking track. She said there are still new walkers coming out to the walking track.